Welcome to the fifth of the occasional Brian’s Travel Spot series, where I attempt to document my various travels around the world. The first of these was back in 2015 when I did my coast-to-coast trip across the USA by train, followed by a return visit to the US this time last year. 2016 was a good year for travel, with a brief sojourn in Porto, followed by a round-the-world trip via Hong Kong, Shanghai and Chicago. I went out to Phoenix for work at the end of October. It was, for me, a relatively short and uncomplicated trip which involved flying there and back with British Airways, the only airline (to my knowledge) to fly direct from the UK to Phoenix, which made the choice rather easy (although see further instalments for more on this since this time I’m flying with Delta…). I booked my customary exit row seat and settled in for the long (10 hour) flight. British Airways uses its 747 fleet for this route and, while this plane felt more modern than the 747 I flew back from Boston in at the start of the year, it had the same cabin layout and, more importantly, it didn’t have that essential (for me) of at-seat power (to the best of my knowledge, none of British Airways’ 747 fleet have at-seat power in economy). Fortunately, my new Dell laptop, for all its faults (and it has many, including a ludicrously unreliable keyboard) is blessed with an exceptionally long battery life, so I was able to make almost the entire journey working on the laptop before the battery eventually gave out. It’s interesting the different perspectives people have on aircraft. As long as I can get an exit-row seat, I don’t mind the old 747s (I prefer them to older 767s and A340s for example) but I really miss at-seat power, which is pretty much a given on modern long-haul aircraft. I got talking to one of the cabin crew and was waxing lyrical about the A380 and I could tell she wasn’t impressed. She confessed she was going on a conversion course for the A380 the following week and wasn’t looking forward to it. She liked the old 747s, she said, and didn’t want to have to learn yet another aircraft. After she reeled off the long list of aircraft she’d flown on (and had been trained on) I can see why some airline like to keep their fleets down to one or two aircraft types! The flight itself was just want you want: smooth, uneventful and on time. Well, I say uneventful. When we landed at Phoenix, we were asked to stay in our seats while the police came on and arrested someone on the other side of the aircraft. Since there had been no disturbance during the flight I can only assume he was on some list somewhere. Even that was relatively uneventful, the arrest done with the minimum fuss. The food was good and I have discovered a new wheeze for improving airline coffee. After my troubles with being forced to ditch my coffee at Beijing, I’ve gone back to asking the cabin crew for a jug of hot water and making it in-flight. However, I’ve changed my technique a little, having discovered that the toilets make a much better option than doing it at your seat. The fold-down baby-changing table is far more stable that the seat-table and no-one tells you off for grinding your beans too loudly. However, the thought of making an Aeropress and then carrying a jug of coffee back to my seat did not appeal, so instead I put my new-found friend, the Travel Press, into action. This allows me to make my coffee and it then keeps it warm. 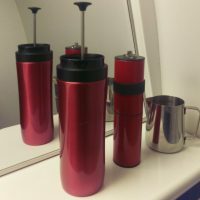 You can drink your coffee straight out of the Travel Press, but I prefer to pour it in smaller quantities into one my many travel mugs (in this case, my Therma Cup) and hey presto, excellent airline coffee. You can see what I made of Phoenix itself after the gallery. As I often do on business trips, I went to my destination (Phoenix in this case) with no great expectations. It was never on my list of go-to destinations and, while I’d often thought about visiting the south-west of the USA, I’d never had the opportunity before, nor had I had a particularly burning ambition to do so. All I really knew about Phoenix was that it was in the desert and that it was hot. The first surprise came when we were flying into Phoenix to land. There were mountains visible out of the window. Now, I’d expected that. I knew that there were mountains around Phoenix. What I hadn’t expected was that there would be mountains in Phoenix. As we came closer to the airport, flying over some fairly densely-populated areas, suddenly a large mountain would loom up (for context, probably one or two thousand feet above their surroundings). What was more surprising to me was the overall terrain. Coming from a small island that doesn’t really do flat (other than East Anglia), I grew up around hills and, in the parts of the UK where there are mountains, they are surrounded by smaller hills. In Phoenix, it’s flat. Really flat, almost pancake-like flat. And then there’s a mountain. Just like that. With almost no warning. To me, that’s a very alien landscape, although if you grew up in Phoenix, you’re probably reading this and thinking “And?”. That’s why in the UK, we don’t really have cities next to mountains, certainly not big ones. There’s just nowhere flat to build them. The impression that I have with Phoenix is that it started off small and, as it spread out, it built around the mountains, a bit like a rising lake, lapping at their skirts. Whatever the reasons, I found it a magical landscape. The next surprise was the temperature. I knew that Phoenix was going to be hot (it’s that whole “built in the desert” thing) but this was late October, so, surely, it wasn’t going to be that hot? When I stepped off the plane, it was 27⁰C. At eight o’clock in the evening! This, in the UK, is considered a very hot summer’s day. The sort of hot that has people complaining how hot it is. And this was in the evening. It was 22⁰C not long after dawn the following day and that pretty much set the pattern for the week, with the highest temperature (recorded by my phone, at least) reaching 37⁰C late one afternoon. On the plus side, everywhere was air conditioned, so, other than brief strolls outside, it wasn’t even noticeable. And it was a dry heat, unlike the humidity that I’d experienced a month before in Hong Kong and Shanghai. This was, though, first and foremost, a business trip. I flew in on Monday evening, picked up my hire car from the airport (as much as it pained me not to use public transport, you absolutely need a car to get around) and drove out to Scottsdale where I was staying. From Tuesday until Friday I was in meetings, nine to five, then socialising in the evenings, although I did get a chance to wander around the area near my motel, where I discovered the awesome Press Coffee. Beyond that, and a trip to a basketball game, I had little chance to explore. However, what time I spent out there, I enjoyed. It felt a relaxed place to live, although I suspect that I wouldn’t enjoy the extreme temperatures of the summer. While I wouldn’t ever say Phoenix is a must-visit destination, I’m looking forward to getting back and spending a day or two exploring the city itself. Come Friday, and the end of my meeting, I took my trusty hire car and drove the three hours north from Phoenix to the Grand Canyon, which is something for another Travel Spot, if I ever get around to writing it. All I will say here is that it was amazing, a literal take-your-breath-away moment with its physical beauty. If you ever have a chance to go, do it. You can see how I got on during my return to Phoenix, starting with my flight over, after the gallery. I returned to Phoenix at the start of this year for another business trip, but this time it was to be part of a longer adventure, which, with luck, you’ll be able to read about in future instalments of the Travel Spot. For now, I want to tell you about my flight over. Having said at the start of this Travel Spot that flying with British Airways was a no-brainer, since it’s the only airline which flies direct to Phoenix, I find myself typing this while sitting in a 767 belonging to Delta Airlines, en-route for Salt Lake City and a rather tight 90-minute connection. Keep reading to discover whether this was a good idea or not! So why Delta? And, perhaps more importantly, why not British Airways? Well, as I’ve repeatedly said, these days I pretty much have to have a bulk-head/exit-row seat so that I can work on the plane. When I came to book the flights for this trip, I’d left it rather late (for various reasons, the trip wasn’t confirmed until a month before I was due to fly). By then, all the economy seats with any extra leg room on the British Airways flight had gone, so I looked at alternatives, eventually deciding on the Delta flight I’m now on. I did this with some considerable trepidation. In 20 years of transatlantic flying, I’ve usually gone with British Airways or Virgin Atlantic. In fact, I’ve only flown with US airlines three times, once with the defunct Continental on a Virgin codeshare (which was excellent), once with American (on a British Airways codeshare) and once with United on a return trip to Chicago. Those last flights, with American and United, both over five years ago, were not great experiences, flying on old aircraft (one even had TV monitors that came down from the ceiling, with everyone in economy watching the same movie) and with relatively poor service. While I can’t speak for American or United (I’ve since flown with both to and from Chicago: while the United flight was okay, flying with American was excellent), my fears regarding Delta have been entirely unfounded. I’m on a modern, spacious Boeing 767-300, with nicely-spaced seats, a modern entertainment system (which I’m not watching, although I am using the map to keep track of where we are) and a lovely, attentive crew. The food is very good and even the coffee is a notch above drinkable! I’ve nabbed a bulk-head seat, a far better option than the over-wing exit rows, which are right next to the toilets and have a lot less room. The seat next to me is empty (it has a broken tray table, so the person there got moved and, no, I didn’t break it, although now I come to think of it, it’s not a bad idea…) so I can spread out. In fact, this might be the most room I’ve had on a plane! Best of all, there’s at-seat power, so I’m very happy with the whole set-up. The in-flight Wifi is even pretty speedy, although it is a tad pricey ($10 for an hour, $30 for the whole flight). The flight itself was smooth and uneventful, something I never tire of saying. The only slight grumble was that we ran into some turbulence a couple of hours into the flight. That’s nothing I have a problem with, but the captain, having turned the seat-belt signs on, then left them on for another three hours, during which time there was no turbulence at all. While I appreciate a cautious approach, I really need to get up and walk around during flights and having the seat belt signs on for three hours when there doesn’t seem to be any turbulence is a real pain. I’ve never been to Salt Lake City (and don’t really count changing planes there as “going to Salt Lake City” either). However, on the basis of what I saw from the plane, I could be tempted. After flying over a largely frozen Canada, and an equally frozen Montana, we hit gold when we finally reached the Rockies. Not having anyone in the seat next to me meant that I had full access to the window, something of a rarity for me. However, I belatedly realised that I had chosen to sit on the wrong side of the plane, having selected the left-hand side without giving it much thought. Of course, if I’d bothered to look at a map, I’d have seen that I would be flying south along the eastern side of the Rockies, and so should have sat on the right-hand side… where I’d have had someone next to me… and so wouldn’t have been able to gawp out of the window… Perhaps it wasn’t such a bad choice after all! Despite this, the views of the Rockies on my side of the plane were pretty special, but the best was still to come. As we started to descend towards Salt Lake City, we appeared to be flying above a long, straight valley, with some glorious views of the mountains which lined the valley’s sides. Then, as we neared Salt Lake City itself, the valley was suddenly filled with cloud, with us flying above the cloud, but descending ever lower until we were flying almost level with the top of the cloud and below the peaks of the mountains. That was a really magical sight. Then, of course, we disappeared into the cloud itself where the views were less interesting. I had been a little concerned about the tight layover at Salt Lake City, all of 90 minutes, but I’d reassured myself that it would be fine. Although Salt Lake City is a Delta hub, it’s not a major destination and therefore I reasoned it would only have a few international flights. This is important because clearing immigration was going to be the biggest challenge: there have been times in major airports such as Boston, New York and even Chicago, where I’ve been waiting for over an hour to get through passport control. Credit where credit’s due, though. Going back to Salt Lake City, the airport is clearly set up for these sorts of connections, with a dedicated line at passport control for people with connecting flights. It was also the case, as I’d predicted, that we were the only international flight arriving at that point. I was through passport control so quickly that the plane hadn’t even been unloaded and when it was, my bag, which had been tagged priority at Heathrow, was the first onto the carousel, something that’s never happened to me before. From there, it was through customs, through a door and there were the Delta ground crew to take my bag off to the plane for me. I think I must have carried it maybe 20 metres after picking it off the baggage carousel. The flight from Salt Lake City to Phoenix was going from the sublime to the ridiculous. Having had perhaps the most space I’ve ever had on an aircraft (it’s neck-and-neck with the A380 to Dubai/Hong Kong), I found myself on a regional shuttle flight, operating a Bombardier CRJ700 (no, I’d never heard of one either). It had two engines at the tail and two rows of seats, holding maybe 65 passengers in all. It was full, too, and a real struggle to get everyone and their luggage on board and stowed away. However, it did the job, got us to Phoenix on time and there were more wonderful views of the Salt Lake City mountains as we took off, although once again I sat on the left-hand side, while the right-hand side of the plane got treated to an amazing sunset. Oh well, you can’t win them all. Check out Part II of Phoenix and the Grand Adventure: My Return to Phoenix, to see what I got up in the city. This entry was posted in Brian's Travel Spot, Phoenix by Brian Williams. Bookmark the permalink.